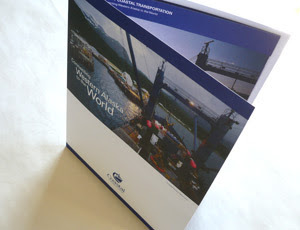 Design Hovie Studios, Inc., has designed the new folders and inserts for Coastal Transportation. Coastal Transportation is a family owned and locally operated shipping company, that has been serving the communities of Western Alaska and the Aleutian Islands through fast, efficient and reliable cargo transportation for over 25 years..
Design Hovie Studios designed the folder and inserts so that photography emphasizes Coastal's dramatic enviroments and locations served. Modular, the system includes 6 inserts sheets and templates that easily allow for additional sheets when needed. The overall look compliments the existing brand developed by Design Hovie Studios as seen in the brand identity, papers, and web site..